Bam Bam was elated to use and review the Mathseeds program by Reading Eggs. This online program offers an application as well as corresponding workbooks for various grade levels. During the review period, we used the online program along with the 200 Essential Math Skills for Kindergarten workbook. Mathseeds offers interactive lessons and games for children ages three to nine years old. After signing up and entering student information, placement tests for each program is offered. The math test allowed for three wrong answers to be made and that determined Bam Bam’s placement in the online program. We used the online Mathseeds program approximately three times each week. The lessons took approximately 10 minutes to work through and the activities were engaging. Our son liked the characters and how the stories included the mathematical concepts being taught. There were plenty of practice problems for each concept. A variety of games are also available throughout the program. During our time using this product, I did not find the site easy to use on the iPad or my cell phone. Often, the graphics did not fit well within the device screen. There were also times that my son was not able to pick the correct option because it was not displayed correctly or at all in some cases. Occasionally, Bam Bam completed lessons yet the progress chart showed that they were not completed. This caused him to have to repeat portions of the program even though he had already passed. Due to the program layout and consistent frustration with the progress chart updates, we will not be continuing use of the online features. We also downloaded the app to our family iPad and it worked perfectly. We will use it to reinforce the workbook concepts. Our favorite feature of their math program is the 200 Essential Math skills for Kindergarten Workbook. This comprehensive workbook offers step-by-step lessons covering numbers, operations, patterns, addition, subtraction, geometry, measurement, and time. There are four worksheets provide for each of the 50 lessons along with quizzes, reviews, and rewards. A yearly planner is provided which coincides with the online program lessons. This helps so you can use one resource to reinforce what is being done via the other. We enjoyed the color illustrations, detailed examples, and learning activities within the book. Learning math vocabulary is also important for this age so I was happy to see tracing words activities throughout the workbook. The only improvement I would like to see is perforated pages. Since this workbook is so full, when you get past the middle it is hard to keep it open and flat. Perforated pages make for easy removal and access so activities can be completed with ease. Currently, the Reading Eggs subscription includes access to Mathseeds. The website is expanding, often adding great new features to enhance the educational experience for students and teachers alike. You can also try out the website features before committing with their FREE TRIAL. During the trial I suggest doing placement tests for each of your children to see where they fall on the Lesson Map. This will also help you determine if this program is necessary for all or just some of your homeschool children. 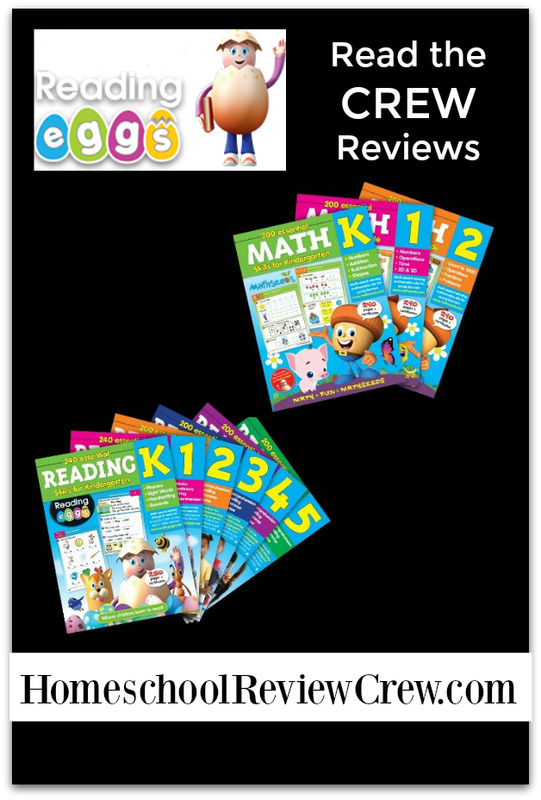 Click the photo below to read other Homeschool Review Crew blog posts about Reading Eggs, Mathseeds, and the various workbooks available.